The President further instructed to jointly implement a program to spray pesticide with the assistance of the public as well as the private sector and launch such a national programme with a time frame. President Sirisena has given these instructions during a meeting held at the Presidential Secretariat, today (22) on finding swift measures to face the challenges occurred in the fields of agriculture as a result of the rapid spread of Sena caterpillar. At present several steps are being taken in this regard and under the guidance of the President, a Presidential Task Force also established to supervise this program. The President pointed out the importance of taking swift decisions to control this menace by the Presidential Task Force. 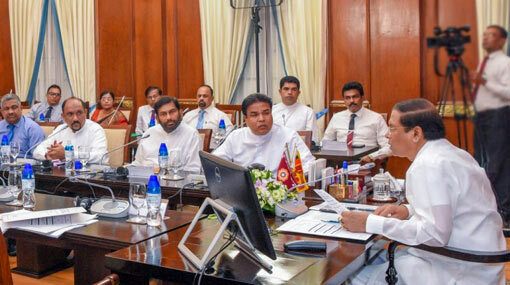 The President also instructed the Deputy Minister of Mahaweli, Ajith Mannapperuma and an Additional Secretary of the Presidential Secretariat and senior representatives of the Ministry of Plantation Industries to coordinate the work of the Presidential Task Force. In addition, the President stated that the implement awareness program for farmers and farmer organizations to educate them on the imperative need to control and eliminate this pest. He asked that the program should be implemented with the participation of the agricultural researchers and field officers of government and privet sector. Ministers P. Harison and Daya Gamage, State Minister Amir Ali, and the secretary of Mahaweli and Environment Ministry Anura Dissanayake, Director General of Mahaweliya, Dr. B.M.S. Dissanayake, Commissioner General of Agrarian Services and Wildlife W.M.M.B. Weerasekara, and the Director General of Agriculture W.M.W. Weerakoon were also present in this discussion.